A peek inside CDF, which has been partly opened. The scale is hard to grasp here, but the ladder at the lower right corner might help. Much of what you can see is detector arrays of various sorts, along with the electronics that manage them. I spent about 7 hours at Fermilab yesterday, touring the facilities and talking to a few of the scientists working there. (Technically the full name is Fermi National Accelerator Laboratory, but nobody really calls it that. Besides, who wants to type or say that every time?) I’m not going to catalog my entire visit on Galileo’s Pendulum, since the main reason to visit Fermilab is for my book. However, I’ll provide you a summary when I’ve finished writing up all my notes for the appropriate chapters. In the meantime, enjoy the photo I took inside the CDF (Collider Detector at Fermilab), one of two huge particle detectors in the Tevatron collider. The Tevatron—which unfortunately shut down in 2011 due to budget cuts—sent beams of protons and antiprotons in opposite directions through a ring about 4 miles around. The particles themselves travel through a thin pipe kept at vacuum, to avoid premature collisions. Both protons and antiprotons are accelerated nearly to the speed of light, giving them extremely high energies. When they collide, much of that energy is converted to mass (using Einstein’s famous E = mc2 equation), which means new particles. Some of those particles were found for the first time at the Tevatron, including the top quark—the most massive of the quarks. 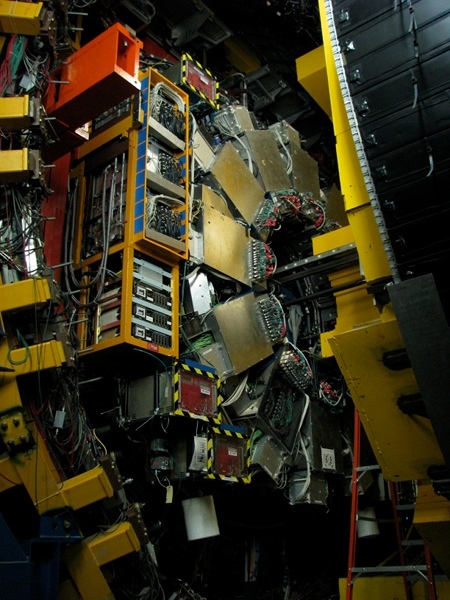 The pipe through which protons and antiprotons travel through CDF. The scale of the picture is hard to grasp, but the CDF is designed to be opened up for maintenance and other purposes. The yellow portion at the right (which is recycled battleship steel) slides along rails until it fits snugly against the main detector array, which is all the gold and green colored stuff. 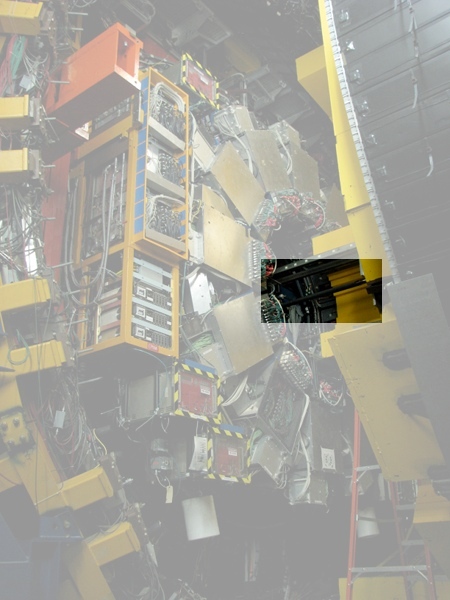 The beam itself is contained in the thin gray tube near the center of the image, which I highlighted in the image to the left. On the opposite side of CDF, the detector was opened even more—and for some reason they even let me climb inside it. (I also climbed into the D0 detector, but unfortunately my camera was acting up, so I couldn’t get photos.) I suspect I’m one of the few who have ever gotten to go inside CDF and D0 who weren’t actively involved with the experiments, so it was a very thrilling opportunity for me. I thank Kurt Riesselmann for setting up and guiding my tour of Fermilab.